Southwark have a consultation running until August 15th that had either gone unnoticed until an eagle eyed cyclist spotted it on the 8th August, or has just gone on-line with an incredibly short consultation period during the summer holidays. I don't use much of the route, which I feel sure is an old LCN one, partly because the location in Law Street where I would join it is so well hidden I didn't know it existed. Riding along it I found some of it a desolate motorcentric area. Despite the motorcentric look there is quite a lot of filtered permeability already in place, albeit mainly with tortuous barriers to cycling too. 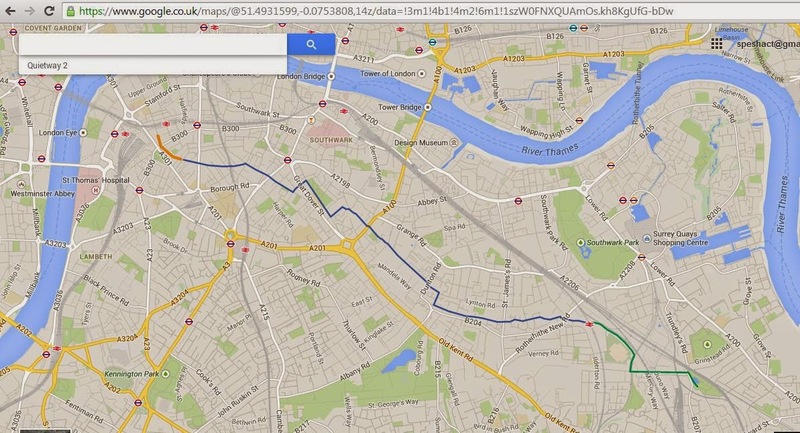 The plans include many good improvements to this route which will make it much more pleasant to cycle along. I haven't ridden it during weekday rush-hour but I question, even with the planned improvements, how much of it will be a route where parents will happily let their primary school children ride independently to school. But I'm not sure if they are intended users of Quietways. The Quietway should have priority at junction of Rossetti Road and Sheppard Drive. Give Way mkgs to be installed on Sheppard Drive either side of Rossetti Road. NB, neither Sheppard Drive or Stevenson Crescent are through roads for motor traffic to the north of Rossetti Road. Bike route logos (adapted 1057s) by Achilles Close and opposite by the car pk entrance need to be in centre of lane, rather than the nearside edge, in accordance with Bikeability teaching. Bike route logos (adapted 1057s) by car pk entrance need to be in centre of lane, rather than the nearside edge, in accordance with Bikeability teaching. This is particularly important if road car parking bay stays and due to the build out. Visually this area is dominated by cars, with lots of off-road parking. The need for on-road parking here should be challenged. Provision of prominent, secure and attractive cycle parking should be considered. 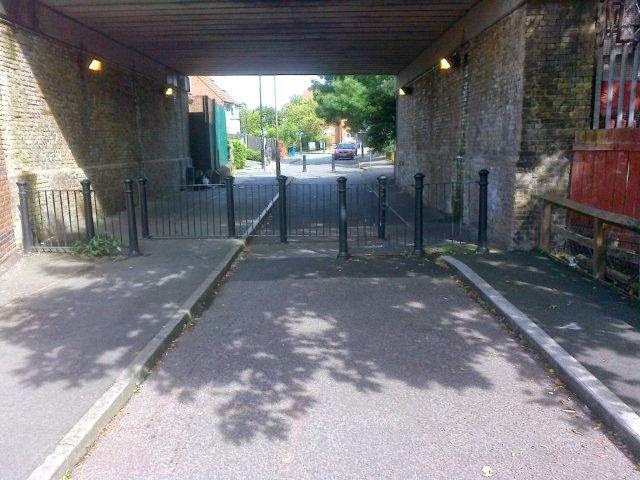 Bin stores and other ways of improving the aesthetic of this cycle route should be provided. The link between Abercorn Way and Paterson Park can be make more cycle friendly. All three sets of Bike route logos (adapted 1057s) should be in centre of lane. The bend on Chaucer Drive needs attention – consideration of double yellow lines to prevent parking and maybe raised table? Bike route logo (adapted 1057) at top of Chaucer Drive, junction with Lynton Road, should be in centre of lane in accordance with Bikeability training. Traffic light controlled junction: To maintain appeal of the cycle route and reduce likelihood of people jumping lights, there should be frequent changes. Would a scramble crossing make sense here? Alternatively, can the priority be switched so Dunton Road users give way to Lynton Road / Chaucer Drive users and lights are not installed? I question the need for a priority ped’n crossing for the cycle track by Arundel Blgs If it makes sense, this should logically be mirrored with Give Way lines on the new ped’n crossing on the Harold Estate Access Road. Bike route logos (adapted 1057s) by Swan Mead are in door zone; should be more central. How much school run traffic is there for Grange Primary School? Swan Mead off Webb St described as one-way except cycles, but markings on Swan Mead and at junction with Webb St don’t make that apparent. There is no passing space without using footway. Should footway become shared space? Tower Bridge Road junction traffic lights need to have short phases to deter red light jumping and nurture use of cycle route. I particularly support the formalisation of the cycle route between Rothsay Street and Law Street as, despite using Law Street often I had no idea the cycle route existed. The close proximity of the cycle route junction with Law Street to the junction of Law Street and Wild’s Rent / Weston Street concerns me. Consideration should be given to squaring up the junction, making a cross roads: Weston Street to Cycle Facility; Law Street to Wild’s Rent. The right turn from Weston Street into Law Street is unpleasant currently. Bend in Law Street – reallocate car parking to reduce likelihood of meeting a motor vehicle in the middle of the road. Consider raised median to enforce slow speed and staying to own side. All four sets of Bike route logos (adapted 1057s) approaching Pilgrimage St should be in centre of lane, not the door zone. This appears to be focussed on streetscape improvements. 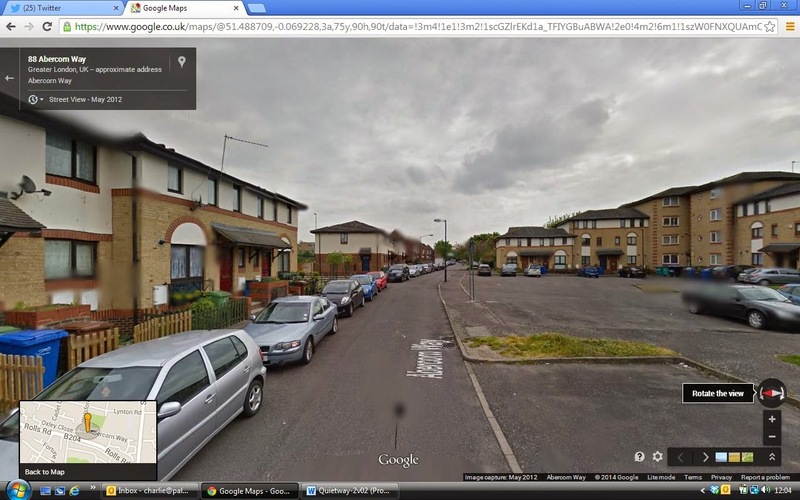 Given a limited budget, it would be better spent on Chaucer Drive to Abercorn Way which has dreadful public realm. The cycle lane should not need to formally give way to pedestrians crossing between Faraday and Shere House. The southbound cycle lane certainly has no reason to give way to vehicles exiting a car park (consideration should be given as to whether this exit is needed or if vehicles can enter and leave solely via the other entrance/exit). The yellow lines there should also be redundant given the through nature of the cycle route. The southbound lane Give Way markings on Globe Street by Cole Street are entirely unnecessary. I question the need for the adjacent Northbound cycle lane markings. The cycle access barriers in Trinity Square should be altered, ideally to bollards, but at the minimum so one short stretch of railing is removed entirely (at least for a trial period) and the other relocated at 1.5m (subject to agreement from Wheels for Wellbeing on mobility access). 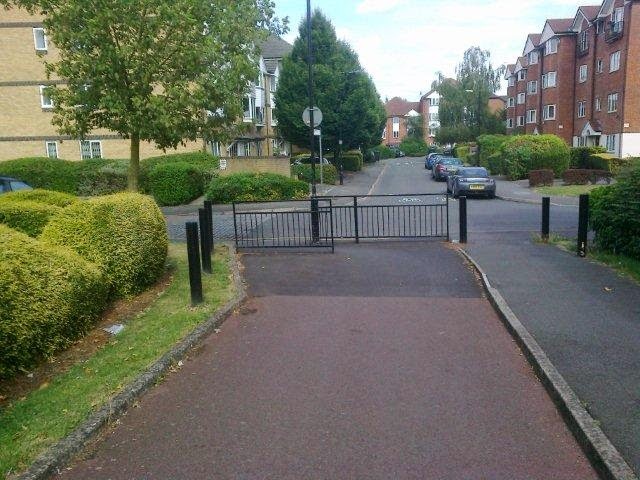 I suspect otherwise some cyclists will continue to chicane through the pavement railings instead. Great Suffolk Street – is there sufficient space for semi-segregated cycle lane and an adjacent lorry? Elephant’s Feet are to left of lane, but given the lane width cyclists would be better to be in centre of lane, esp if turning right, and going s/o from Trinity St to Gt Suffolk St where the 1057s are, appropriately, shown in the centre of the lane. Concerned over Elephant’s Feet leading to edge of lane rather than centre of lane in roads opposite, esp with Webber Street junction immediately after lights going westbound, posing a left hook risk for riders going straight on. Question space for semi-seg’d lane and adjacent lorry on Gt Suffolk St approaching Swk bridge Rd. Consider pavement continuing across mouth of Friars Primary School car park entrance. Elephant’s Feet across Blackfriars Road should lead to safe riding position in subsequent lane. Between Webber Row and Gray Street the single yellow line should be made double yellow, no loading as narrow width if cars park up there given parking opposite also. Consider ways to further filter motor traffic on this street.